When running a business of any kind you want to cut costs where you can, in order save money on overhead for your company. These extra costs include new equipment unless the existing equipment is beyond repair, along with many other expenses. However if it involves the safety of the employees than the cost is justified and should be used wisely. If you run a machine shop then you want to have good shop presses that are not only built correctly, but made to last. These Hydraulic presses should be made to work right, and have parts that are easily found from the same company. If you stick to buying shop presses from whoever has the cheapest price, you will end up paying a lot more for it than you think. A used press could have problems you were not aware of, such as not being able to find compatible parts. Another problem companies run into when buying different hydraulic presses is they end up with equipment and parts from multiple companies. These means separate orders, separate service people, separate phone calls, and separate maintenance. Over all this means separate bills and time spent out of your day. 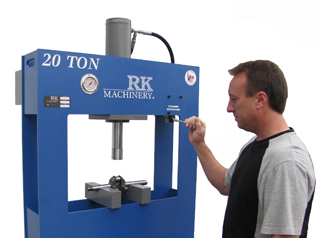 With the right shop presses found at RK Machinery not only do you get the largest variety of Hydraulic Presses but you get them all in one location. This means service, excellence and quality are found in the same place. Any additional parts that you either want to add or need to maintain your equipment are standard in North America making them easy to find, replace and repair as needed. RK Machinery contains presses such as the H Frame press, C Frame press, Gantry Straightening Press, Forklift Tire Press and many more. And since they are the industry leader in hydraulic presses it goes to show you that they put full quality craftsmanship into each and every one of them that is made. But there are more ways that these presses can save you money. Buying good, quality equipment you know it will last far longer than a used machine or a machine from a company with a lesser reputation. Overall this will save you money in the long run. These types of presses don't meet your needs? Perhaps you need something a little more custom to the needs of your shop, or the equipment you are building? That happens to be a specialty for RK Machinery. They will custom make a hydraulic press exactly for what you need.